That didn’t work and I hollered for my husband to bring the camera. 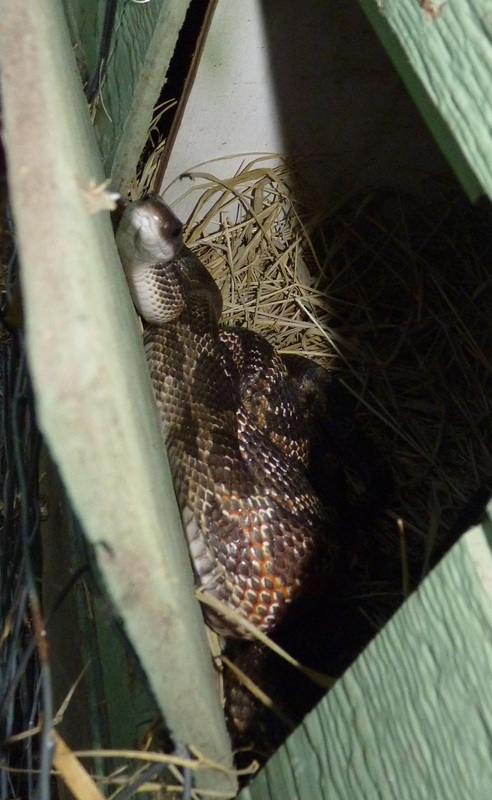 We got several good pictures of this lovely Texas rat snake before opening the other door to the coop to chase him out. He got 2 big eggs and a banty egg! This is blurry but you can see how long he is. Rat snakes aren’t venomous, but they are a little disconcerting because they are great climbers. I have seen one here at the farm (maybe the same one) at the second story level on a pine tree, being attacked to no avail by blue jays, mockingbirds, and woodpeckers all together. He (or she) had probably cleared out a few of their nests. They also can sense heat and will drop onto anything warm, not stopping to figure out if it is actually prey-size. At the historic park where I used to work, we sometimes had a very small rat snake find its way into a mostly unused ladies’ restroom, climb up into the rafters, and catch some poor unsuspecting tourist off-guard. 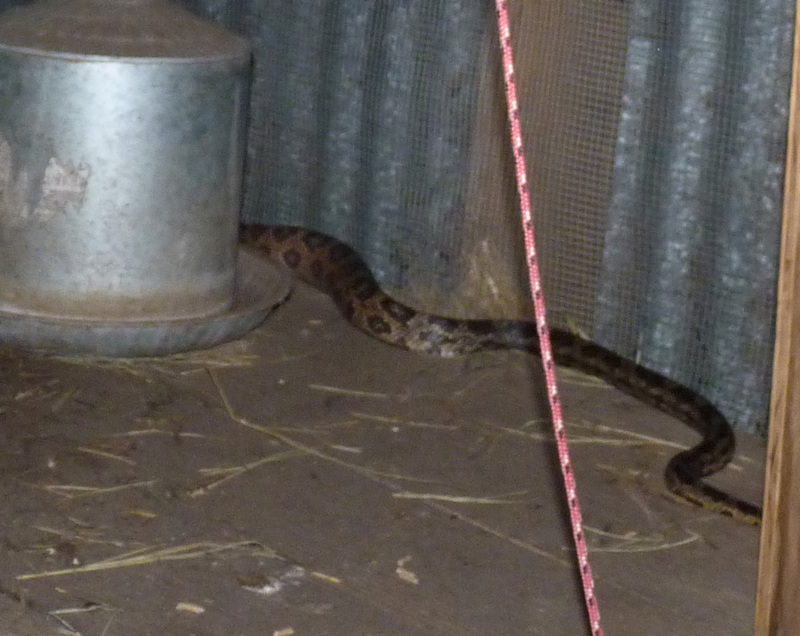 I’m not afraid of snakes, but I don’t want one to get the drop on me, so I will be reinforcing my chicken coop this week! OK, here is the best pic. Look at the colors on those scales! I know! I swear I can read their facial expressions! 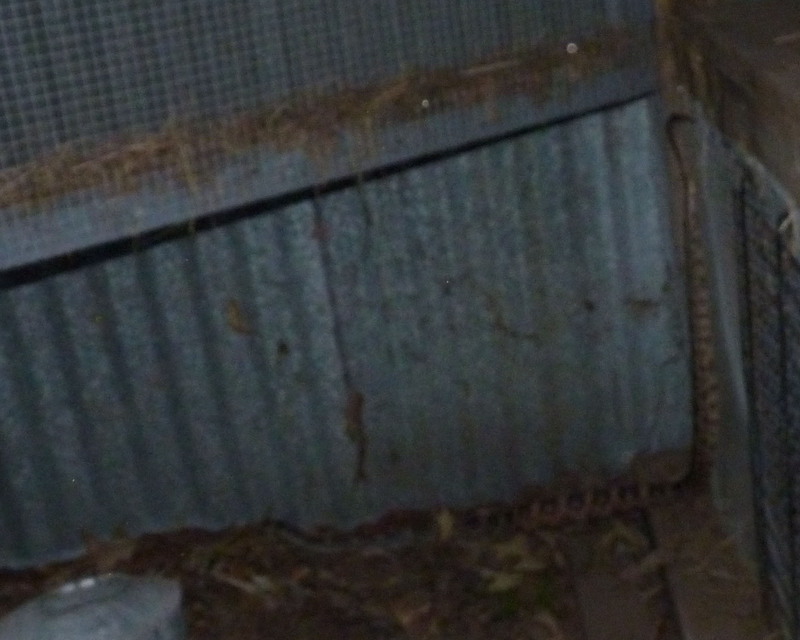 I’m okay with snakes, spiders, and bats, but can’t stand small spaces – we’ve all got something that creeps us out! So glad this was not about killing it; we always grew up with a healthy respect for snakes, my dad wanted them around for rodent control. My mother-in-law hates them and runs them over with her lawn mower; it makes me batty! Love the Indiana Jones reference above, made me giggle. That was my very amusing husband. He will be glad to know he caused a giggle!